I twisted my back the other day as I opened a heavy field gate. It was so painful that I called off a trip to the coast with my pal Bill - not funny. I spent all day yesterday doing very little and taking the odd painkiller; this seemed to work so by last night I was thinking "Perhaps I could go fishing in the morning?" I checked the tide table and found that I didn't have to get up too early, as my favoured mark wouldn't be accessible 'til about 06:20. Excellent! The alarm went off and I gingerly eased out of bed - the back felt OK so I got up, dressed, grabbed the rod and the bag, put on the chesties and set off for the coast. It was a beautiful morning and my spirits rose as I walked along the shore to the tide race. I was pretty early (I always am) so I'd have to fish the less productive base of the ledge to start with. The prospects seemed good with a strong ebb current well under way. There was already weed showing on the surface so I started with a weightless, weedless Slandra - NOTHING! After fifteen minutes I decided to switch to a popper which has caught me good fish from that spot in the past - again NOTHING! Now my pals would tell you that I'm not given to chopping and changing lures but after a further ten minutes I decided to try a small Mepps, having seen a couple of flash expansions of fry which suggested the presence of small predators - still NOTHING! The sun is now well up and the sea flat calm and clear with the tide still a bit too high to access the main race. "Nothing doing, might as well pack in Mike." I'm thinking. As the thought crossed my mind another group of baitfish sprayed out only a rod's length from where I stood. Then another and another. Out went the Mepps but it kept snagging the weed and the fish showed no interest. Time for another change? I rooted in the lure box and picked out a green-coloured, weedless, EvoStix Redgill. First cast I had a pull and missed it. Two or three casts later I was in and I landed a nice little bass of about a-pound-and-a-half. A few more cast and another missed bite. The tide was falling fast I could probably wade to the ledge. It still looked tricky but I couldn't resist, so I picked my way slowly onto the rocks. Now I could fish the race and there were fish splashing and terns beginning to feed. The current was roaring past and it was obvious that the lure was going to be far too light so I slipped on a small cone lead and tied on one of Bill's white Slug-Gills which he gave me years ago. Out it went into the torrent and straight away I had a pull which I missed. 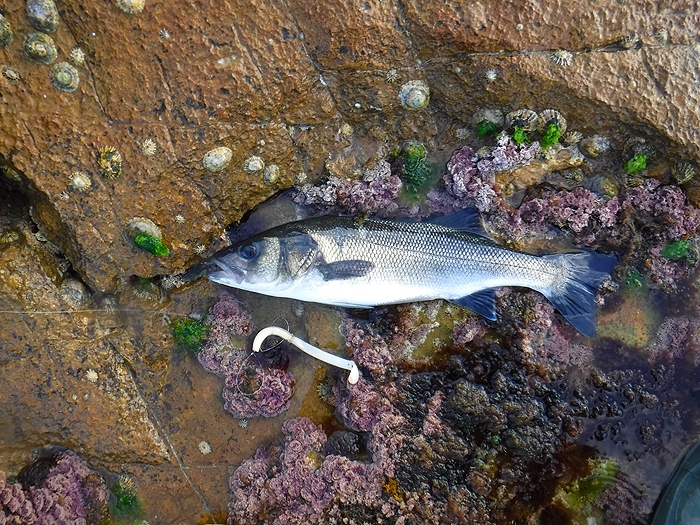 The body of the lure was twisted up the hook shank so there was no doubt it had been a bite (I knew it was anyway). A few more casts and I had a three pound fish which fought like a demon in the race. Magic! I took its picture and put it back before starting again. I tried a short cast and let the lure swing down over the ledge. Just as it reached the crease it was taken and a bass a bit bigger than the last one ripped line off against the clutch - it took quite a while before I could slide it ashore. Now there seemed to be less fish activity and the birds had left so I opted for my regulation three last casts. On the fifth one I had a strong pull. This MUST be an altogether bigger bass I guessed - then it went to ground. Wrasse? 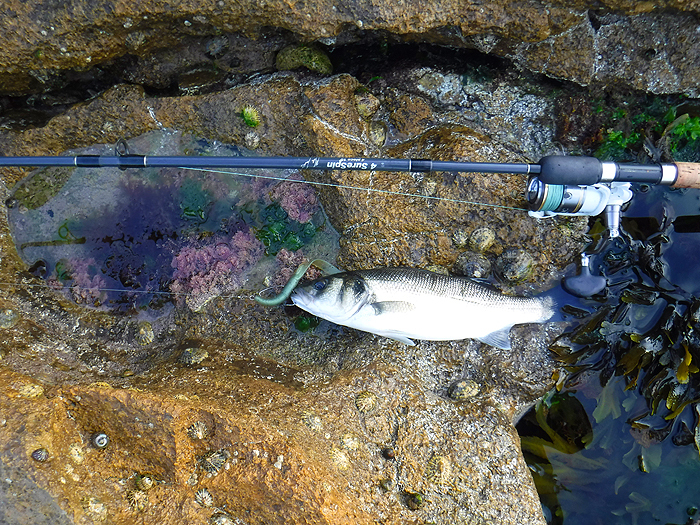 I eased off the tension and it came free, it was on the move and then it wedged itself down on the bottom again - double wrasse? Ease off again - eureka! 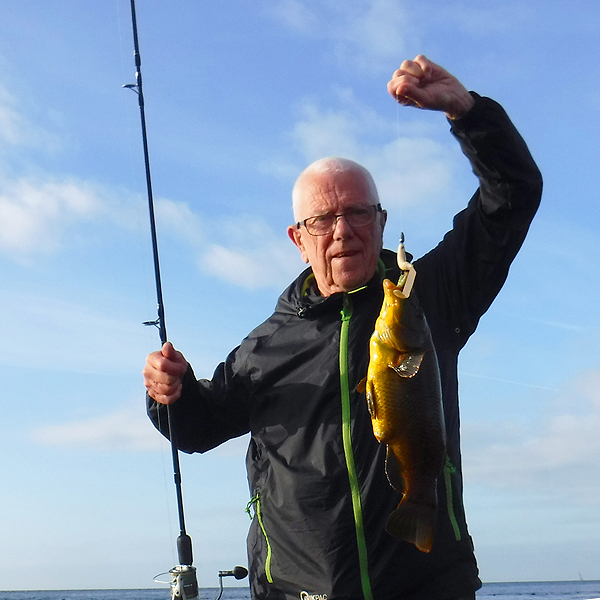 It came free and I pumped it to the surface - sure enough a fantastic golden scaled wrasse. Just another three casts without a bite and I packed in well satisfied. The first and smallest bass took a green EvoStix lure. A bigger bass on a home-made white Slug-Gill. 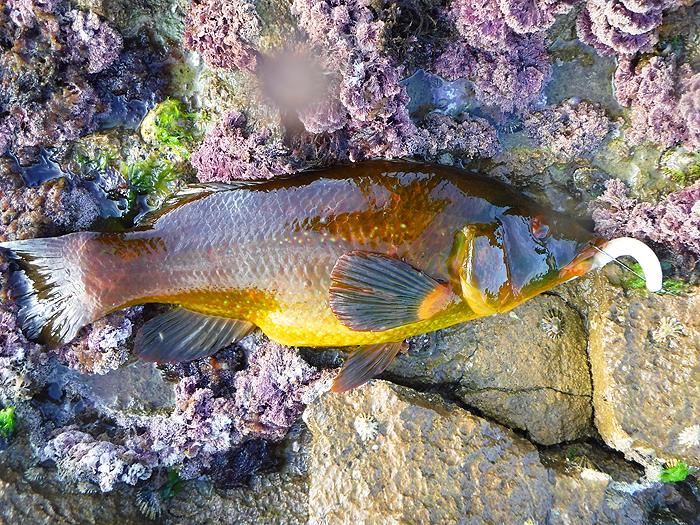 The stonking wrasse again on the Slug-Gill.